**UPDATE: Please note that I have recently learned that Disco Dust is now being considered non-toxic but not edible and should only be used on decorations that will be removed and not consumed. In the case of these cupcakes, you would want to remove the music notes before eating. This blog post was written before my knowledge of this change. Elvis may be gone from us but his music is as alive and well as ever. 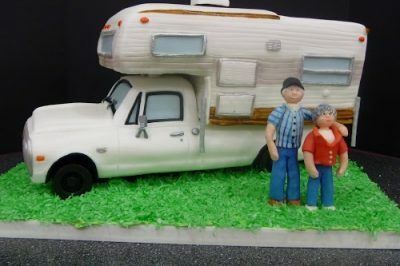 I am a huge fan of “The King” so I thought I would come up with a cupcake creation in his honor for this rockin’ anniversary. It’s a well known fact that Elvis’ favorite sandwich was a peanut butter, banana, bacon sandwich so I decided to use these flavors to create a cupcake that would be worthy of his fame. 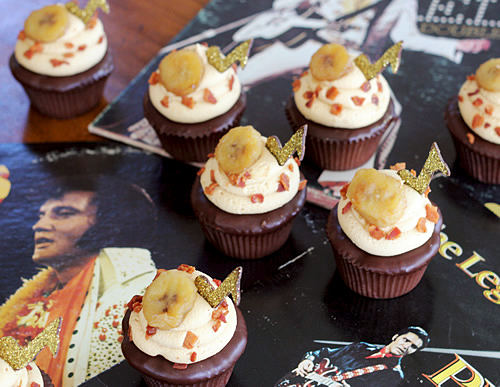 I introduce to you: Elvis Cupcakes! 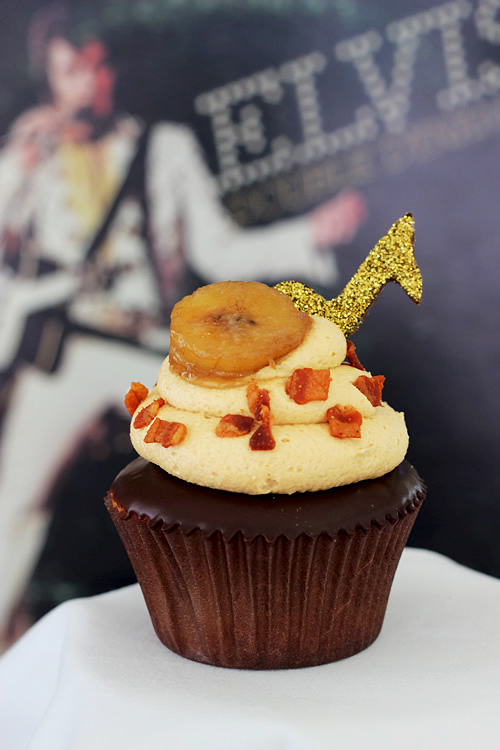 These cupcakes are made with a banana cake, filled with peanut butter icing, topped with chocolate ganache and more peanut butter icing, then adorned with bacon pieces, a caramelized banana slice and a sparkly dark chocolate music note. Can you say “Yum”? I have to tell you that these turned out even better than I thought they would. One of my friends kept raving about how amazing they were, only to find out later that he doesn’t even like bananas. I’m not real crazy about the whole bacon with sweets fad but I have to say that this time it was a perfect addition to the sweetness of the rest of the cupcake. All the flavors were just incredible together. I can now understand why Elvis loved his sandwiches so much. The only thing I would possibly change next time is the caramelized banana. When I caramelized the bananas I added some rum to them. I felt like the taste of the rum was a bit overpowering so I think next time I will just use butter and brown sugar on the bananas and forgo the rum. My family seemed to think the rum taste was fine though so maybe it is just me. Okay, are you ready to learn how I constructed these scrumptious little cakes? I started with a banana cupcake recipe that I found on Food Network’s website. I only used the cake part of the recipe. I was kind of expecting the cupcakes to taste like banana bread but they were much different. They were sweet, light and moist. I fell in love with the cupcakes and probably could have eaten them all straight from the oven. This recipe is definitely joining my list of favorite recipes. According to the original recipe it is supposed to yield 12 cupcakes but I got 18 when I made it so I have changed the amount for my printed version. Click here for a printable version of the Banana Cupcake recipe. While the cupcakes were baking, I made my bacon bits and chocolate music notes. 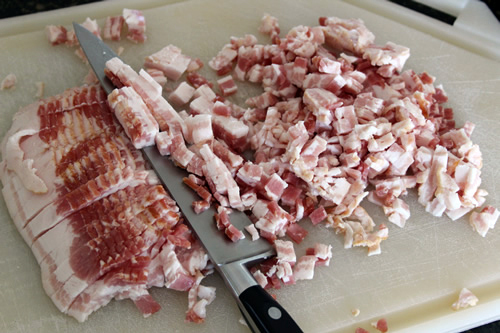 The easiest way to make bacon bits is to partially freeze the bacon first so that it holds together when you cut it up. 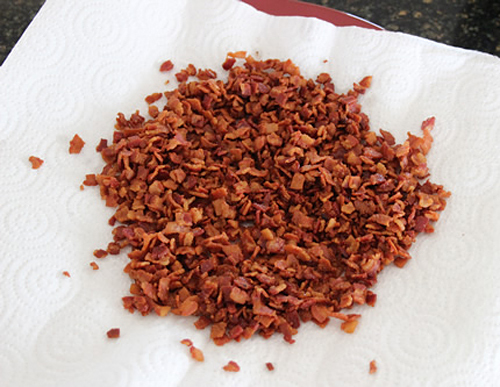 Fry all the bacon pieces over medium high heat until they are crispy. Drain the fat then pour the finished pieces onto a paper towel to cool. For the chocolate music notes, I melted a dark chocolate Ghirardelli candy bar in a metal bowl over a pot of simmering water. Be very careful to continuously stir and melt completely but not let it get too warm or it will become discolored when cooled. It should be warm to the touch but not hot. I turned the heat off the burner once the chocolate started to melt a bit to make sure the bowl didn’t get too hot. 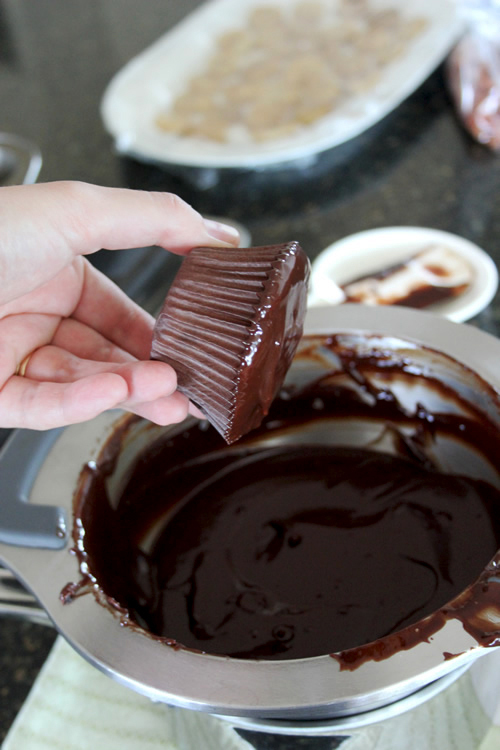 Once melted, I poured the warm chocolate onto a baking sheet lined with waxed paper. 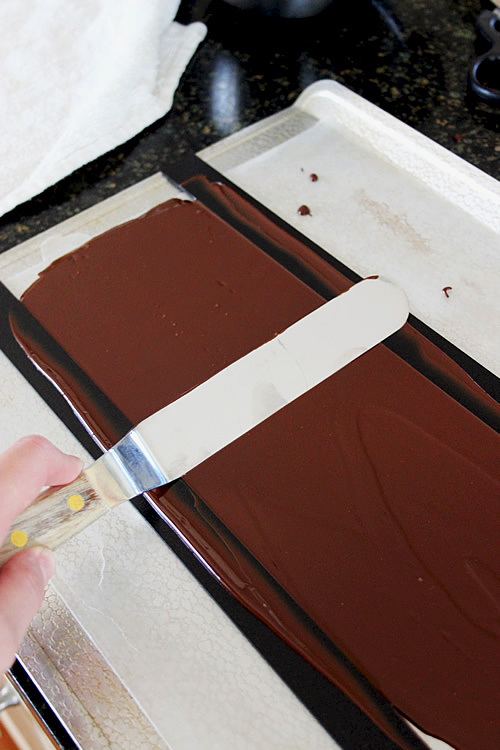 I laid Perfection Strips down to help me keep an even thickness as I spread the chocolate with an angled spatula . 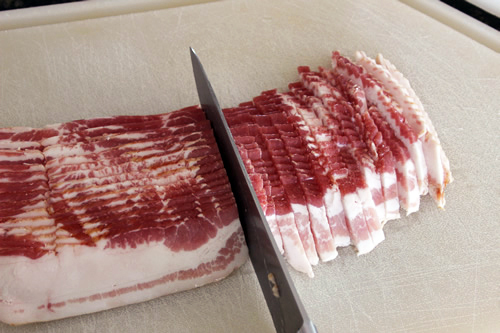 I love my Perfection Strips. I use them all the time for so many different purposes. I then placed the chocolate in the refrigerator until it just began to set. The shine should be gone but it shouldn’t be so firm that it breaks. 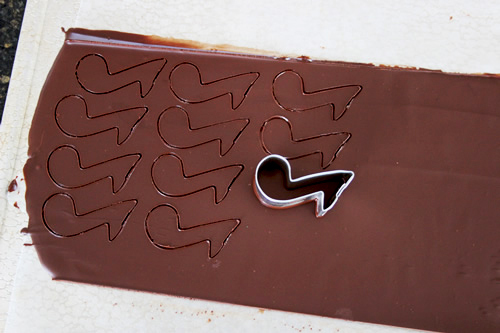 Using a mini music note cutter , I cut music notes out of the chocolate then placed them back in the refrigerator to set up completely. 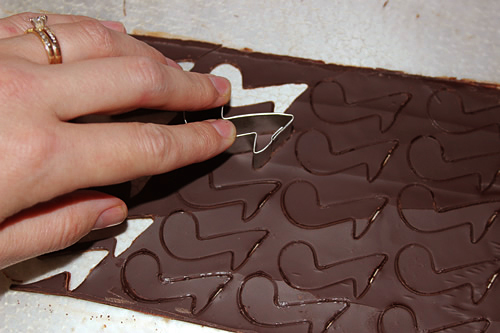 When they were set I placed the cutter over them again to break them away from the rest of the chocolate. 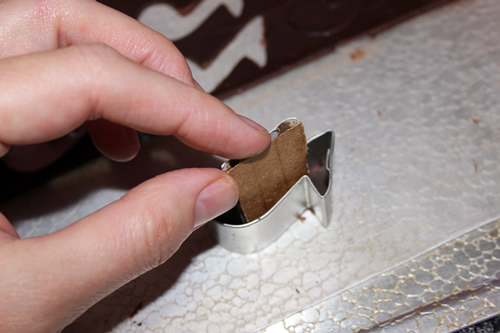 I found that using a small piece of cardboard helped me to slide them out of the cutter without breaking them. It was then time to give them some sparkle. 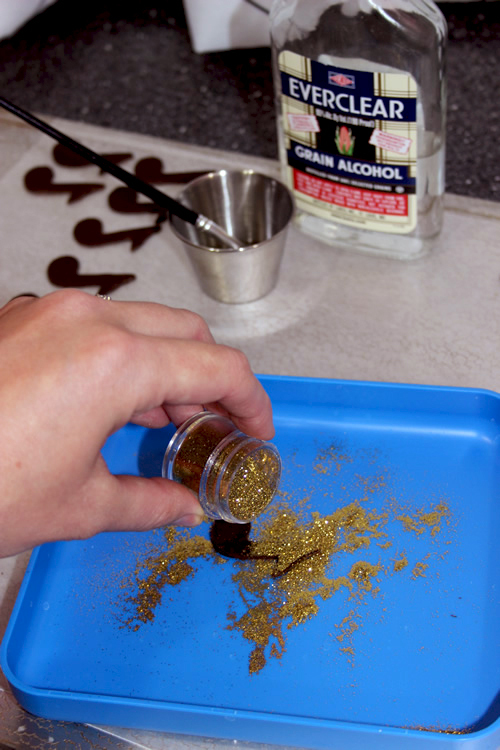 I brushed a little bit of Everclear on each note (the alcohol evaporates the moisture quickly so that it is damp just long enough to attach the dust) then poured on some gold Disco Dust . I shook off the excess and then had a shimmery adornment for my cupcake. Disco Dust is edible and gives amazing sparkle. It is also quite messy though, so be prepared for getting dust everywhere. I pour it on over one of these trays so that I can then easily return the excess back into it’s jar. After the cupcakes were baked and cooled, I filled them with my favorite peanut butter icing. I use this recipe a lot so you have probably seen it on several of my other creations in the past. For more information on how to fill a cupcake, see my past blog post Chocolate Covered Strawberry Cupcakes for your Valentine. Click here for a printable version of my Peanut Butter Icing Recipe. Once all the cupcakes were filled it was time to top them with chocolate ganache. To make the ganache I poured a 12 oz. 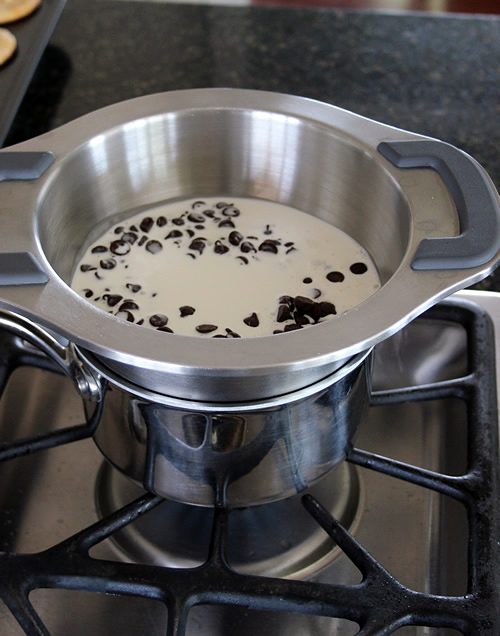 bag of Ghirardelli semi-sweet chocolate chips into a metal bowl that rested over a pot of simmering water (make sure the bowl does not touch the water in the bottom pot) then added 1 cup of heavy cream. I slowly stirred the mixture continuously until the chocolate melted completely. I then dipped the tops of the cupcakes into the mixture and twisted them to keep them from dripping. 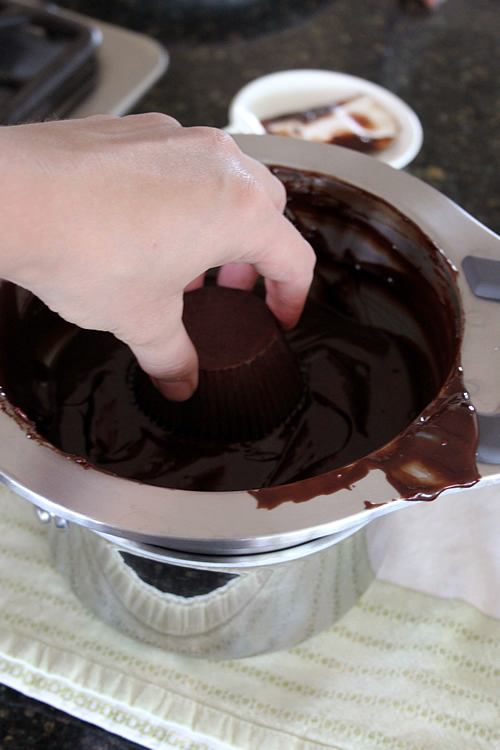 You can see a video on how to make the ganache and dip the cupcakes here at TLC.com. When all the cupcakes were topped with ganache I placed them in the refrigerator for about 30 minutes to set up. While waiting, I made the caramelized bananas. I don’t have pictures of the process but it was fairly simple. Like I said before, I think next time I will forgo the rum as I thought it just added too strong of a taste. That is personal preference though. Click here for a printable version of the Caramelized Banana recipe. I then removed the cupcakes from the fridge and finished them off by adding more Peanut Butter Icing, using a #1A decorating tip , and then adding some bacon, a slice of caramelized banana and a music note to each cupcake. Okay, enough with the puns. Enjoy! Those are great. I bet Elvis would have loved them! Very cute. Please remind people that the musical notes are not edible because disco dust is plastic craft glitter and not to be eaten. To make the notes edible, edible glitter made from gum arabic, sanding sugar, or gelatin should be used. Hi Rae. Thank you so much, I actually was just seeing information on this in the last couple of weeks for the first time and had planned to do some more research into it. 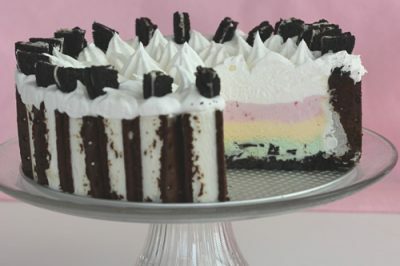 I have been using disco dust on cakes and cookies for several years and eating it, as I know many others have as well. I just saw someone posting something the other day about it not being edible and I was very surprised. It was never marketed that way before. That really stinks since I especially love to use it on cookies. I will add a note onto this post. Thanks for letting me know. Thanks so much for your kind response. Most people that I contact about it are not nearly as understanding. I have been “cyber-slapped” more than once, believe me. Anything you can do to spread the word on the use of truly edible glitter–either store bought or homemade–will be a great benefit to all decorators and their clients. I’m so sorry to hear you’ve been “cyber-slapped.” That is awful. If we are going to serve people food we have a responsibility to make sure it is safe to consume. I am so sad to find this out about Disco Dust since I love it so much and was always under the impression that it was sugar based since cake shops sell it right along with their other edible decorations. I will have to do some more experimenting with other edible glitters now instead. I can provide you with some links to different recipes that work well using gum arabic or gelatin. Sanding sugar can be colored in a zip lock bag with a dot or 2 of gel/paste color. Rub it around until the color is incorporated. To bump it up a notch, edible pearl luster dust [FDA approved] can be added. I won’t add links here to the suppliers, but I can also give you that information, should you need it. Sorry, Rae, I’ve been off the computer for a few days so just now seeing this. Those are some great ideas. I will have to try them in the future. 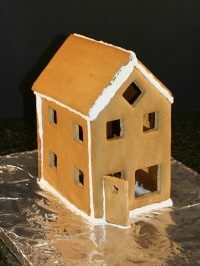 I have found a few links for recipes so I will experiment with them when I get some time. 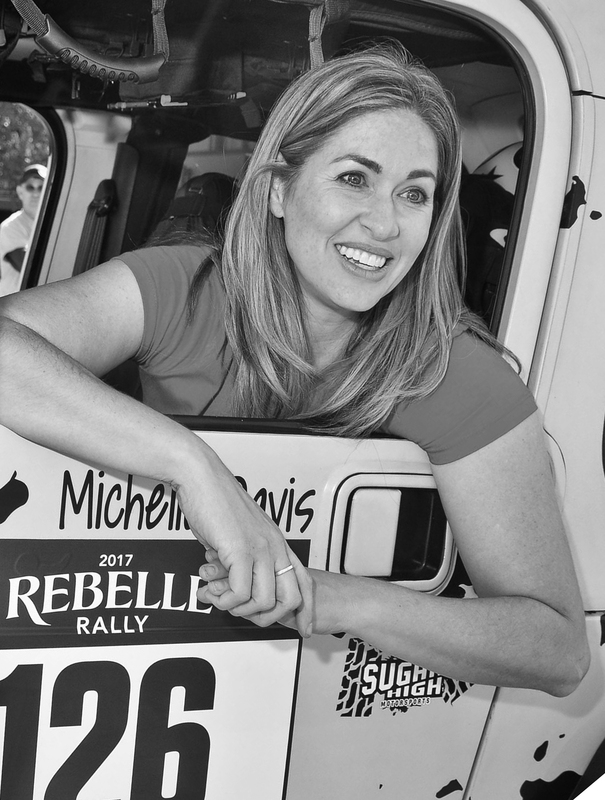 Feel free to add your recommended links to this post so that my readers can find them as well. Thanks again.